Woo-hoo! Two days in a row! Today, I thought I’d talk a little bit about some good graphic novels that I picked up recently. I’ve not been in the habit of heading to the comic book shop very often, but twice in the last month or so, I’ve been to Chapel Hill Comics for book launches from friends. Those friends being Mur Lafferty and Angie Shearstone. I was there to buy Heaven and Blood Dreams on each day, but while I was there, I picked up several other things as well. These are but a few of them. 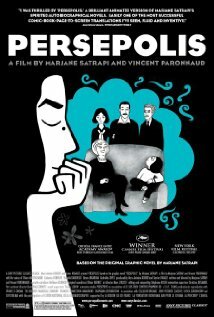 This is an autobiographical graphic novel about an Iranian woman who grew up during the Islamic Revolution which occurred in that country. I had heard good things about the animated film based on the book , but had not seen it. The book is really wonderful. The story is told in an episodic fashion with a very simple but effective art style. It is at times very funny, at other times sad, sometimes scary, but always fascinating. Here in the US, if we think of Iran at all, it is usually in the context of wondering if we’re going to have to do something about how THEY don’t like us. But the truth, of course, is that many different kinds of people live there, and have hopes and dreams and feelings. However, the various anecdotes about roving “morality” squads, checkpoints, disappearances and war also serve as good reminders of how important our freedoms can be. I really enjoyed it, and have purchased the follow-up book as well, though I’ve not read that one yet. This is a supernatural horror/mystery series by Joe Hill and Gabriel Rodriguez. I’ve now read the first three collected volumes and it is truly great stuff. 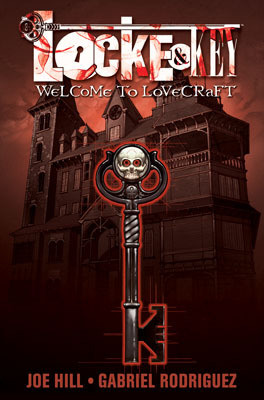 When the father of a family is murdered under strange circumstances, his wife and three children move back to his childhood home in “Lovecraft, MA”. There’s something unusual about this house. (I know, right?) Its many doors and keys have all sorts of powers: Powers of transformation, powers of healing, and let’s just say: “Powers of NOT-healing.” What could be a fairly ordinary premise is really made compelling by interesting characters, beautiful art, and a nicely twisted story, full of things that really only work in a graphic novel. There are things you will see on these pages which just wouldn’t work in any other medium. Really looking forward to volume 4. I’ve now read the first two collections of this graphic novel. 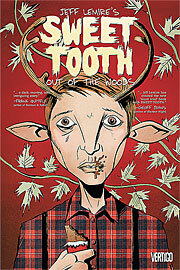 It stars Gus, a young man with antlers. He’s never known anything but his simple cabin in the woods, and never known anyone but his father. His father has told him that a horrible plague came to the world, to purge it of all sinners and to take the virtuous up to heaven. It also, apparently, caused many children to be born as human-animal hybrids. All of that remains the mysterious unknown, however, until his father finally succumbs to illness, and Gus decides to do what his father told him to never do: Leave the forest. What follows is an interesting take on the now-common post-apocalyptic survival genre. Gus himself is endearingly sweet, and pretty smart, despite his lack of education and knowledge of the outside world. I enjoyed this one, but don’t feel especially compelled to continue. I might pick up the next volume if I see it, but probably won’t seek it out. So that’s all for this time, though I have a few more that I may review soon. Have any of you read any good graphic novels lately? July 7th, 2011 | Christiana | Tags: comics.